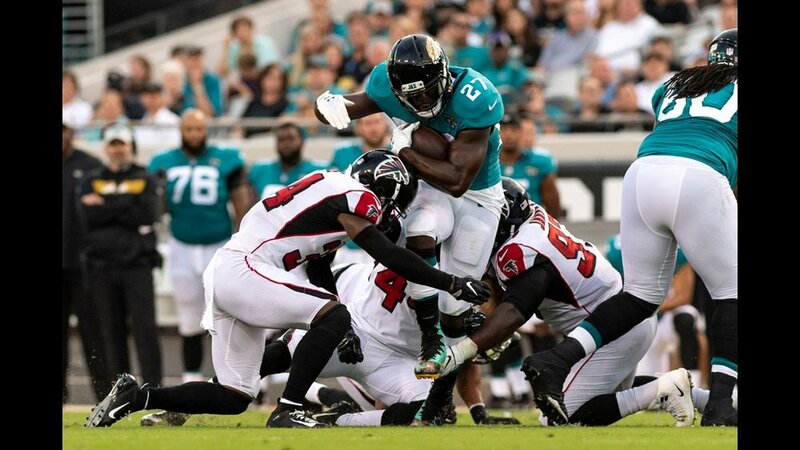 In previous years, preseason week 3 has been THE dress rehearsal for the season, with starting units often playing the entire first half, and sometimes going deep into the third quarter. And so we expected to see all but a handful of elite running backs and wide receivers, and any players with nagging injuries, give it a go. But what we got was a noticeable drop-off in play for starting players, league-wide. Flacco, Rodgers, Trubisky, Dak, and Goff didn’t even play. Carr threw three passes. Bradford threw 4. Watson threw 6 passes. Rivers threw 7. Alex Smith threw 8. Brees threw 9. The rest of the QB’s played between a quarter and a quarter and a half for the most part. Bell, Gurley, Gordon, Antonio Brown, Beckham Jr., Julio Jones, David Johnson, Allen Robinson, Ajayi, Devonta Freeman, Howard, and Lynch didn’t play. Lamar Miller and Hunt had 3 carries each. Alex Collins had 1. Cook had 2. Anyone who had so much as a cough, like Barkley and Jamaal Williams, didn’t see the field. It means that anyone who scheduled their drafts to follow preseason week 3 in an effort to be as informed as possible didn’t get much out of it. That’s a strategy I’ve always used, and it backfired on me this season. Those of us who were high on players like: Royce Freeman, Peyton Barber, Chris Hogan, Marquise Goodwin, Chris Carson, and Alex Collins, should have been drafting them two to three weeks ago when they were excellent bargains. They’re all going for retail now. Meanwhile, those of us who knew enough to avoid: Jordy Nelson, D’onta Foreman, Ronald Jones, basically any top 7 QB and TE other than Gronk, had a real leg up on things a few weeks ago, when people were drafting them 3 rounds too early. But as of now, most casuals have picked up on these things. I’m seeing less QB’s get drafted in the first 6 rounds than ever. My mock drafts from three weeks ago are far better than any team I can draft now. Next season I plan to schedule all of my drafts to immediately follow preseason week 1. That’s late enough to know quite a bit, but too early for the casuals to know much. Andrew Luck played well, completing 8 of 10 passes for 90 yards and a touchdown, and adding 27 impressive yards on 4 runs. The problem is, Luck hasn’t thrown any bullets or bombs for the entire preseason. He’s good enough to move the ball down the field with short and medium-ranged passes, so I’m not predicting some kind of wasteland here. 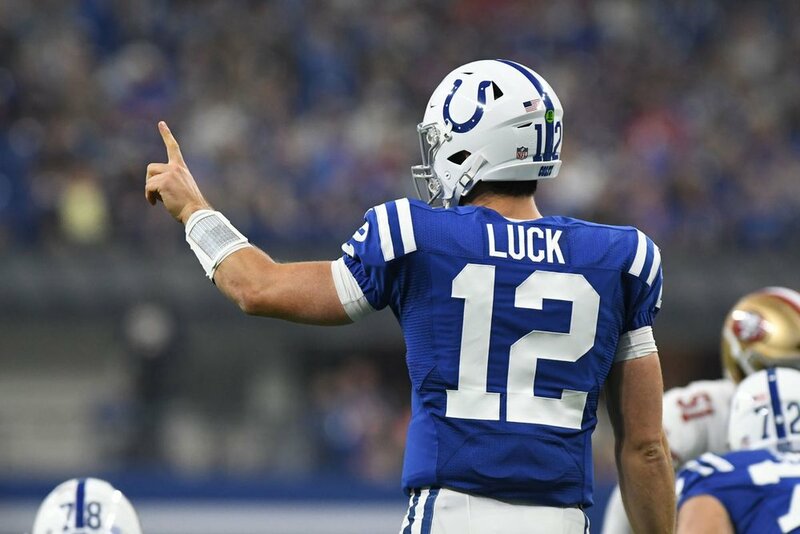 But I am comfortable assuming that Luck’s arm strength is a work in progress, and that the huge plays many not be there for a while, not like they once were. Therefore, I am off drafting Luck, who has been steadily rising in ADP. If Luck takes a more measured approach to his game, with more underneath throws and screens, what does that mean for the rest of the offense? For Hilton, I think it takes the possibility of a MONSTER season off the table, but he should still be a fine asset, as he will get plenty of targets. He had 2 of Luck’s 10 completions on Saturday, and could push for 100 receptions this season. On the surface, this would all be great for Doyle, who put up Delanie Walker-like per game stats last year without Luck, and who has been trending in the right direction in the past couple of weeks. But then Eric Ebron broke out Saturday with 5 receptions on 5 targets, for 54 yards and a touchdown. Doyle started and played, but didn’t even make it into the box score. The Colts play a lot of two tight end sets, so both will see plenty of action. But it didn’t look like Ebron was going to eat much of Doyle’s target-share since the Colts are thin on pass catchers to begin with, and since Ebron had been so quiet in the other preseason games. This game really clouds things. If your TE plan was to just draft Doyle late, you may need to seriously re-evaluate that plan. I’m moving Doyle down to only a borderline TE-1, and Ebron up to a mid-range TE-2. If Luck is playing more of the short game as I anticipate, either of these tight ends could be a top 5 guy if the other were to get injured. Then there’s the headache at running back for this team. A few weeks ago I wrote about how overrated Marlon Mack was, and how this backfield was a total nightmare. At that point, Mack was going in the early 6th round, even though the Colts made it clear that Turbin, Hynes, and Wilkins were all going to see plenty of snaps this season. . Then Mack got hurt, and he tumbled in ADP, while the rookies both took turns approaching single round ADP’s at one point or another. And here we are a couple of weeks later, and both rookies have squandered their opportunity with Mack sidelined. Hines has been the only competition to Ronald Jones for the title of “worst preseason running back.” After fumbling 4 times in the first 2 games, Hines had 6 touches for -1 yard on Saturday. It’s not often you use the singular for the word “yard” when discussing football, but Hynes is no ordinary underachiever. Wilkins hasn’t done much either, and rushed for just 28 yards on 14 carries in the game. He was only averaging 3.6 ypc in the first two games. For all of the great things we heard about him in training camp, Wilkins hasn’t flashed any special tools in the preseason, and may have fell to the 5th round in the NFL draft for legitimate reasons. Christine Michael could actually lead the team in carries in week 1, since Mack is very questionable for that game, and since the rookies don’t appear to be ready. All of which makes me come back to Mack, who might actually be a decent deal now! You can get him as an RB-4 or even an Rb-5 in some drafts, which is crazy considering he was a high end RB-3 a few weeks ago. Mack’s hamstring injury isn’t considered serious, and you wouldn’t need him in the first few weeks of the season, before the byes hit, anyhow. Mack isn’t great, but he’s the best this team has, and he might catch plenty of short passes and screens once he returns to an offense where Luck is dumping off more than he used to. But you should only target Mack if he continues to be a bargain. Garoppolo looked OK, completing 9 of 19 passes for 135 yards with no touchdowns or interceptions. But in yet another drive that stalled, he threw a pass that easily could have been intercepted near the goal line. And this is a good time to bring up last year’s stats. Sure, Jimmy G. was piling on the yardage last year in his starts, but he only threw for 6 touchdowns, with 5 interceptions in his 5 starts. We might continue to see him struggle to get in the end zone, with his lack of real end zone and red zone weapons to throw to. I expect Garoppolo to be right around top 5 in passing yards this year, but he won’t match the TD totals of guys like Ben, Stafford, or Rivers, yet he is often drafted before them. I’d rather wait a full round and get the TD’s. Goodwin looked great, again, with 3 receptions for 40 yards on 4 targets. His ADP has soared, and he is now the overall #50 player. In expert leagues, he’s going at the tail end of round 4! More often than not, you’ll need to draft him early in round 5. I think he’s going to have a great year, and he was one of my breakout candidates for this season. But seeing him enter the late 4th round discussion makes me very sad that I didn’t participate in drafts a couple of weeks ago when he was an 8th round, WR-4. Painful as it may be, I think you have to consider Goodwin in the 5th. I really don’t see any WR’s I like better going behind him. And I like just about every WR going in front of him more. Goodwin’s ADP is exactly what it should be. But then there’s Pierre Garcon, who came to life a bit on Saturday, catching 2 passes for 62 yards. Prior to the week 8 game when he got hurt, Garcon was on pace for 86 receptions and 1,104 yards last season. He had 0 touchdowns, but he didn’t have the luxury of playing any games with Jimmy G. And even without the touchdowns, Garcon was on pace to be a lower end WR-2 in Fantasy. Garcon’s ADP has tanked as Goodwin’s has risen, and Garcon is drafted 60 picks later than Goodwin now! He’s 32 years old, and not exactly the most durable player, but Garcon should fill in well as a PPR WR-3 this season, and you don’t have to pay that price for him now. If Garcon is your WR-4 in PPR, you’re in good shape. The Chiefs starting D had no answers for the Bears 2nd unit, and I don’t think they’re going to be in many low scoring games this season. Mahomes looked sharp, going 18/24 for 196 and a touchdown. Last week I mentioned that Tyreek Hill had really improved on his short route separation down the stretch last year, and that was highlighted in preseason week 3, when he caught all 8 of his targets for 88 yards. At this point, I’d rather have Hill than Mike Evans or T.Y. Hilton, and they both go before he does. Mahomes jumped Goff in ADP after his big TD throw last week, but is still going behind Matt Ryan. Mahomes is the only QB going outside of the top 10 who wouldn’t shock you to finish top 3. He may also be mediocre, but If there was ever a year to roll the dice on a QB late, this is it. Watkins continues to be on a different page than Mahomes, only reeling in one of his 4 targets for 15 yards. Watkins has dropped about a full round in ADP since his preseason struggles, but is still a high risk pick in the early 8th round. Hunt didn’t play much, but caught a touchdown, and has a high ceiling in an offense that might turn out to be explosive. Conner got the start at running back, and didn’t do a lot on the ground with 18 yards on 10 carries, but he caught all 6 of his targets in the first half for 52 yards. Bell had a ridiculous 406 touches last season, plus another 25 in the playoff loss to Jacksonville. Conner is the 58th running back taken, sometimes not even getting drafted. You can waste your pick by taking Theo Riddick in Standard or Blount in PPR, or Rob Kelly and Doug Martin in any format, but I’d rather sit on Conner than those guys, who all go higher in drafts. Ben Roethlisberger looked like himself, passing for 114 yards on 11 for 18. With Antonio Brown out, 8 of Ben’s 18 attempts were to JuJu, who had 6 receptions and 46 yards. We also learned that James Washington might actually still be in a battle for the 3rd WR duties, as Hunter played ahead of him and scored a touchdown. Washington is still a deep roster target in dynasty and best ball, but that’s about it, barring an injury to one of the two starters. Ben has such great pass catchers; he even has good backups in case someone gets hurt. He’s a great value right now. JuJu’s mid-4th round price tag is perfectly acceptable if you need a WR in that round. He’s not the biggest WR, and he’s not even the fastest WR. But he has such great instincts, and Ben loves him. I’ve heard people knocking him because his per target production was too good to be true last season. But he’s going to get a lot more targets this year, so it’s OK if the production comes down. And they have the best Wide Receiver and the best Running Back in the NFL – I think that makes it easier for him to put up higher production per target than he would on any other team in the league. Marcus Mariota was total disaster in what might have been the most meaningful performance this week from a fantasy perspective. He played deep into the 2nd quarter, yet threw only 8 passes. And that is because the Titans could not stay on the field, as Mariota was ineffective. He wound up with 5 completions on the 8 passes, for only 43 yards, + a bad interception. He also missed a wide open Corey Davis on what should have been an easy 3rd and long completion to keep a drive alive. He held onto the ball and took a couple of sacks as well. He’s been bad this preseason. Experts keep telling us to ignore the fact that Mariota threw more Int’s than TD’s last season (15 int’s/ 13 passing td’s), because the expectation is that there will be improvement playing in Matt LaFleur's new offense. It doesn’t get much worse than 13 passing touchdowns in 15 games, so marginal improvement wouldn’t even mean much. He needs to take huge steps forward, and I’m not sure that happens. #1) it might take him a month or even a season to get comfortable with this system. #2) He might just be bad. Either way, a breakout looks unlikely to me. If we think there is a good chance that Mariota won’t be very productive, I’m not sure Corey Davis is worth his late 5th round ADP. We don’t even know if Corey Davis is ready to break out if Mariota is good. But if Mariota is mediocre or worse this season, Davis is going to be tough to trust. He has great tools, but he and his QB have so much to prove at this point. The Titans rewarded Taywan Taylor’s awesome performance last week by starting Tajae Sharpe ahead of him this week. Taylor eventually got in some work, but only caught 1 of his 5 targets for 9 yards. Deep leagues only. With Mariota not scaring anybody, it was tough to get the running game going for the Titans. Henry had just 12 yards on 5 carries, while Dion Lewis had 11 yards on only 3 carries. However, Lewis did catch all 3 of his targets from Mariota for 20 yards. And with this offense certainly not all systems go right now, Mariota might be checking down a good amount, and the Titans might be playing from behind more than originally anticipated. Lewis is going a full round and a half behind Henry in PPR, and if you gave me the choice between the two at the same price, I’d take Lewis at this point. He’s the only player I want from this team. The Browns QB’s weren’t as good in this one, both taking a couple of sacks each, and not really hitting anything big. Don’t draft Tyrod Taylor. I understand that he’s been a decent fantasy QB, and that he has great pass catchers. But the Browns are still bad, and I think we’ll see Mayfield come in when the game is out of reach, and eat some valuable garbage time minutes at Tyrod’s expense. And half way into the season, they might just give Tyrod the hook anyhow. Landry was targeted 10 times between the two QB’s, but many of the throws weren’t great, so he only had 3 receptions for 23 yards. Not a great line, but the volume is what we want to see. Njoku caught all 4 of his targets for 25 yards. Gordon is getting close to a return, and a Dez Bryant signing still isn’t off the table. It’s a crowded group of pass catchers and the QB play isn’t going to be amazing. We’re seeing Landry and Gordon both go around the same spot now, in the middle of the 4th round. I’m off them there, but would be interested in either if they fell a round. With Trey Burton shooting up the board to the 6th round, Njoku is now the more sensible deal in the late 9th round. He’s a big time talent, and he’s so efficient with his targets, that the log jam of pass catchers here affects him the least. He could be a borderline top 5 TE, even if Landry and Gordon play well. This game just showed us more of what we should already be expecting to see in Miami. Last week I focused on Drake, and made the point that the big plays were no fluke – he’s just elite at breaking off chunk gains. In preseason week 3, Drake only had 5 touches, and TWO of them went for 30+ yards! This is what he does. One of his two big plays was a 36 yard reception. It wasn’t a YAC screen play; it was caught on a deep route. He actually ran plenty of these routes last year, and I think this helps to explain why his pass catching efficiency #’s looked poor compared to other running backs. He’s simply running more challenging routes, and his QB play was near league worst through much of last year. I’m confident that Drake will handle a fair share of third down duties for the Dolphins, which would really mitigate some of the negative game scripts, especially in PPR. His only competition for pass catching duties is the rookie, Ballage, who hasn’t practiced or played in weeks, and was scolded by Tannehill for missing blocks. Drake is a quality RB-2 this year. Tannehill looked decent again, passing for 115 yards and a TD on 11/16. Stills and Amendola continue to get the lion’s share of looks from Tannehill. Stills caught all three of his targets for 28 yards, while Amendola caught 2 of 4 targets for 23 yards, including a nifty TD. I like the value on both of these guys. They’re going in the double digit rounds – Stills is the 48th WR off the board and Amendola is the 62nd, and that’s in PPR. Those should be late round targets for you. Amendola will be flex-worthy in PPR until he gets hurt; and even if that’s just half way into the season, you’re getting good value from him. Stills has a decent floor and ceiling in both scoring formats. There were so many targets that vacated this team; it’s surprising to see these guys so low at this stage. There wasn’t much going on in this game, but Amari Cooper made a freakishly good catch for a 49 yard gain. Nobody is disputing his talent or even his target opportunity for this year. But I do question whether or not he’s an underachiever, and I also question this offense. Most are expecting a big bounce-back year for Cooper. Reasons being: 1) Crabtree was hogging targets and now he’s gone. 2) The Raiders offense and their QB, Carr fell apart last year mostly due to injury. 3) Cooper is still young and has had major success before. I don’t love the first point there. Crabtree faded badly as the season went on, and only had 618 yards. Crabtree may have hogged goal line looks, but touchdowns weren’t the problem for Cooper, who had 7 last year, his career-best. And I’m not sure the second point is all that relevant. Is anyone expecting the Raiders to have a good offense this year? Does anyone still think Carr is a top 10 QB? I think the QB and the team are most likely to be mediocre. Regarding the big time bounce-back potential, what would he really be bouncing back to? His 2nd season was his best, and that’s the year the Raiders offense was on fire, when he finished with 83/1153/5. He’s currently the 16th WR being taken in drafts right now. So if he bounces back to his best season’s stats, his current ADP is right at par value. Don’t get me wrong, those are still very attainable #’s for Cooper, but I’m not expecting any better. There is also just a hint of melt-down potential after having a brutal season, plagued by the worst drop rate in the NFL. Cooper, even with the melt-down risk, is a perfectly fine WR-2 this season, but I wouldn’t reach for him in the 3rd round. He doesn’t always make it into the middle of the 4th round, but that’s where he makes sense. The Panthers were one of the few teams that let their 1st stringers play the entire first half. They even gave McCaffrey 14 touches, which was a little surprising. He was solid, but averaged a mortal 4 ypc on 12 for 48. He also had two receptions on two targets, netting 16 more yards. The gap between Kamara and McCaffrey isn’t huge right now. In PPR, I’m taking McCaffrey over Julio, Cook, and Beckham. Cam was also decent, completing 11 of 17 for 142 yards, with no int’s or td’s. Cam has slipped to the tail end of the 6h round, and that’s about the first time I would think about taking a QB, especially if there’s no “easy” WR/RB pick at that stage. Wentz is hurt, Watson is coming off a major injury, Brady is ancient, Brees was flat out bad in fantasy last year, and Wilson lost some of his pass catchers. Meanwhile, Cam’s pass catchers are better than ever, and I don’t think it’s crazy to think that he’s the 2nd or 3rd best fantasy QB right now. Olsen may have gotten himself back into the “possible TE plan” with this game. He caught 4 of his 5 targets for 44 yards, and looked really good in doing so. We know that Graham’s explosiveness is cooked, and I think people were assuming Olsen’s probably was as well. But that doesn’t appear to be the case; he can still play. His biggest issue isn’t his ability, it’s that there’s a lot of competition for targets on this team now. I remember thinking that Burton can give Olsen-like production 4 rounds later in the draft. And now they’re both going in the same round! Even after slipping a few spots recently, Olsen’s early 6th round ADP still feels a little high. I think he makes more sense in auction leagues, where his price is usually more appropriate. DJ Moore failed to catch any of his 3 targets, and I think it’s silly at this point to assume that he, and not Devin Funchess, will be the #1 WR on this team. I’ve seen people make that prediction, but rookie breakouts are rare; and there are rookies with better opportunities out there. Funchess caught both of his targets for 35 yards. He’s been steadily falling in ADP for no real reason. He’s on the verge of being a 9th rounder now. I love him anywhere in the 8th. Cam and Funchess had something special going at times last year. He doesn’t have great hands and he doesn’t run crisp routes. But he’s a massive target for Cam, and he’s going to get you big plays and touchdowns. Blount got the start and was an effective plodder, picking up 45 yards on 11 carries. That’s a couple of weeks in a row with Blount right around 4 yards per carry. He’s exactly what the Lions thought he was. Abdullah was the 2nd running back to come in, and he ran for 30 yards on 7 carries. Kerryon Johnson didn’t come in until the middle of the 2nd quarter. He rushed for 25 yards on only 4 carries. Riddick scored a touchdown, but that came in the 3rd quarter, so I wouldn’t read much into that. I’m not drafting any of the running backs from this team. I could be wrong on the rookie, Johnson. He’ll have opportunities to get going, and could take over the backfield if he starts to break out. But it’s just too crowded, and he’s still going in the 5th round, despite Blount, Abdullah, and Riddick mixing in with the starters all preseason. Golladay only came down with 1 of his 5 targets in the third preseason game, but it went for 36 yards, and was almost a touchdown. We keep hearing that he is going to be an important part of the team this year. Marvin Jones and Tate started the game, but Golladay was on the field early enough. This team is very weak at tight end, and Luke Wilson might be injured now. So it’s possible that all three wide-outs have value this year. I am buying into Golladay getting deep targets and some goal line looks this season. And I don’t think that will interfere with Tate much, so I still think Tate is fine. However, a big increase in targets to Golladay could take away from Jones, who has been the team’s home run threat for the past two seasons. Jones’ ADP has come down just a few spots since the Golladay talk has heated up. Jones has a habit of outperforming his ADP every year, so I’m not ruling him out completely. But he doesn’t usually long enough to where I’d be comfortable drafting him at this point. How many more times do we need to see it? Running behind the same line, Peyton Barber has been averaging 5+ yards per carry in the preseason, while Ronald Jones is struggling to average more than 1 yard per carry in these games. They’re still going within a couple of picks of each other towards the end of the 7th round, which is madness. If you get Barber in the 7th, you did great. Jones is a long ways away. I’ve written off the Buccaneers pass catchers, because there’s just too much competition for targets. This group has the most top to bottom talent in the NFL. I recommended drafting Howard at the end of your draft if you strike out on your other targets, based solely on the theory that talent does have a habit of prevailing. Howard probably doesn’t need a lot of targets to be a TE-1 anyhow. He caught both of his targets on Friday for 22 yards, and he did some work last week. I’m happy with him in the 13th round if I miss out on Gronk, Njoku, and Burton. You know who else goes in the 13th round? Chris Godwin does. He caught all 3 of his targets for 27 yards, and scored his second touchdown of the preseason, getting an A+ on the eye test in the process. And after seeing him play throughout the preseason, I think he’s officially a buy for the same reason as Howard – talent prevails. Godwin has the potential to be an elite WR one day, and he can be your WR-6. He could easily end up with 600 meaningless yards on a bad team with too many other pass catchers. But getting someone this talented in the 13th round is too tempting. Shepard’s 10th round price is steep, and he’s been on my do not draft list because the targets just aren’t going to be there without an injury to Beckham, Engram, or Barkley. Well you do learn things in preseason, and I’m learning that Shepard might be worth an early double-digit round pick in spite of his low target projection. Shepard had a big day on Saturday, catching all 7 of his passes for 78 yards. Some of Eli’s throws were not good, but Shepard is elite at tracking the ball once it’s released. He did plenty of that last season as well. He caught some passes that were really ugly, because he’s such a natural at judging where the ball is headed, and instantly adapting his position accordingly. I think he will be very efficient with his targets this year, so he can still be relevant without a big target load. Maybe not much better than a solid bye week fill-in or flex, but that’s still acceptable value in the 10th or 11th round, especially when you consider the upside if there was an injury to one of his target-share competitors. People draft Tevin Coleman because he gives you some stand-alone value, along with premium player upside if Devonta Freeman were to miss time. You can think of Shepard in a similar way. Marqise Lee is done for the year with a leg injury, and that does open the door for a breakthrough from one of the remaining pass catchers. Prior to the Lee injury, Moncrief was irrelevant, and no better than their #4 WR. But with the Jaguars down their possession receiver, it makes sense for Moncrief to see work. He did have 62 yards on 3 receptions in this game, and he has a lot more experience than the two receivers he’s competing for targets with. He’s also not as good as them, and the Jags made it clear that he wasn’t even as good as Lee, so I wouldn’t expect too much. That leaves Cole and Westbrook, and I think they’re both worthwhile late round picks at this point. Cole is the safer bet, because he will see slot work, and he was a fantasy producer down the stretch last year. But Westrbook has serious talent, and the Jags are going to give him opportunities to break out. If it’s late in your draft and you’re looking for someone who can scrape together some decent production during bye weeks, take Cole. But if you can afford a higher ceiling/lower floor guy, Westbrook fits the bill. Fournette had 10 carries for 57 yards, including a touchdown run that reminded many of us of former NFL greats. Some see Bo Jackson, and I’ve heard Adrian Peterson comparisons. He looked more like prime Jamal Lewis to me, which is a huge compliment. In any event, people clearly see greatness when he runs. He’s on the right team, with an improved offensive line, a decent schedule, and ideal game scripts. Fournette is ready for a big season and you should be licking your chops to get him late in the first round. The Vikings passing game was more in sync in this one. Cousins passed for 182 yards, with 17 completions on 28 attempts. Diggs and Thielen have been heavily targeted by Cousins in back to back weeks, but he’s finding more success when throwing to Diggs so far. This has been appropriately reflected in ADP, with Diggs moving up to the very early 3rd round, while Thielen is now going at the end of the 3rd round. Cousins is still figuring things out with his new team, Diggs has been somewhat injury prone, and Thielen might find it hard to repeat his massive success from a year ago. But this offense will do big things as the season progresses, and I think all three of them are acceptable at their current ADP. Not bargains, but acceptable. Adrian Peterson got the start, and pushed forward for 56 yards on 11 carries. He’s already seeing some single digit round love in drafts, and he likely won’t last past the early 10th in either format right now. Peterson is still capable of running hard, and pushing piles forward. But that’s about all he can do. He can’t run routes, he can’t make sharp cuts, and he’s not going to run away from anyone at this stage. Physical limitations aside, he also doesn’t know all of the plays and blocking schemes, so he’ll be operating within a limited play set. In New Orleans, defenses knew that Peterson wasn’t coming in on passing downs, and that helped make him and the offense ineffective when he was out there. I don’t see that being any different here. Peterson had two big games last year, playing with the Cardinals, against poor rushing defenses. He followed each of those games up with a sub-2.0 YPC dud. It didn’t seem like he was able to handle real volume in back to back weeks. The Redskins are going to use plenty of Chris Thompson, so long as he is healthy. And if he’s not healthy, Kapri Bibbs will come in and play the same role. For early down grinding, they’ll use a mix of Peterson, Perine, and Kelley. So I think Peterson is a waste of a pick in PPR. In standard I suppose there’s some appeal, but should he really be going 100 picks before Perine? I’m off Peterson in either format. The Broncos first team offense looked sharp in this game. Keenum moved the ball down the field, making good use of what should be considered an elite group of pass catchers. Sanders has been very active these past two weeks; he had 4 receptions for 61 yards in this one, and also ran a score in from 27 yards out. People seem to forget just how good this guy can be with any type of competency at QB. Demaryius Thomas had an unsurprisingly quiet preseason, but he’s easy to grade as a solid, unspectacular WR-2 in PPR. Sanders is the better value of the two. 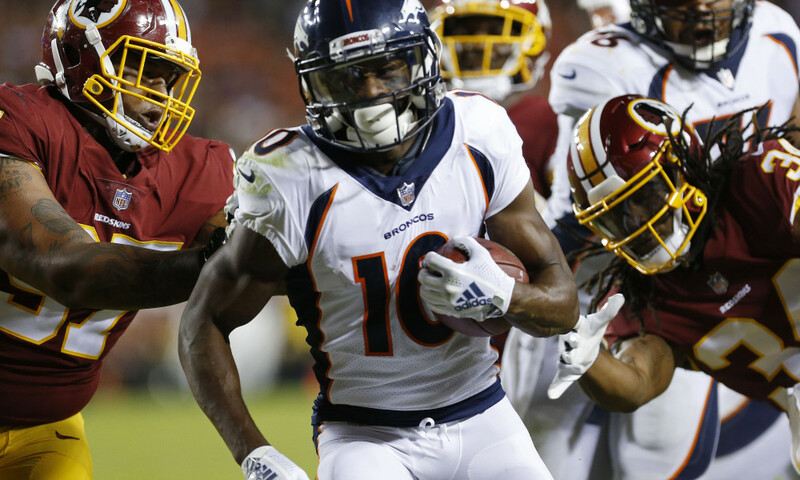 Courtland Sutton, the rookie, had 3 catches for 45 yards, and seems to have earned his way into real playing time this season. Sutton flashed elite tools, and could develop into a Pro-Bowler one day. He’s someone you should try and target in Dynasty. Barring an injury, his usage is unlikely to justify a roster spot in re-draft leagues this season. But he’s going to have some big plays this year, and only further solidifies Case Keenum as an undervalued backup fantasy QB.